I feel like a Pioneer. Not in the way where they were super faithful and walked across the country for they faith. But the way of cleaning without a washing machine or a sink. 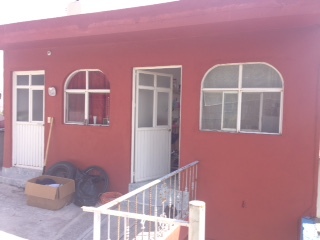 We recently moved to the bigger city of Aguascalientes due to more work opportunities. Jose has started his own company called “Home Running Repair”. He does construction and I am so proud of him! He has been able to stay VERY busy. I want to talk about the purpose for this post. We purchased a small camping gas stove with two burners so that I can cook food. 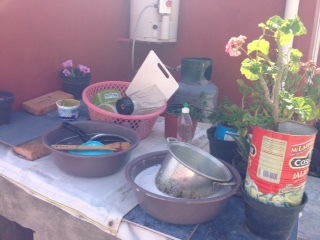 We have a small table which I prepare the food on, cook the food, and then we eat. Washing dishes has become an interesting task. We have WONDERFUL neighbors down our street. Hermana Michaus has offered to let us clean our dishes in her sink. We did that for the first few weeks, however, I will be honest…I feel bad for imposing on them every day to clean dishes. So we bought two big bowls that look like those pans you use to pan for gold, but plastic. I fill them up with water from the small sink in the bathroom and take them outside. One is for washing, the other is for rinsing. The 3rd bin is for drying. The leftover rinse water goes to water all those flowers I have. This little table is actually a dog house for our landlords’ dog, Canela. 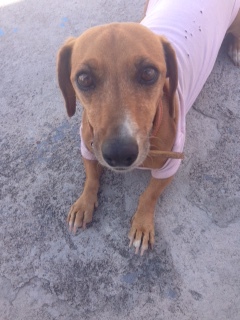 She is a very protective dog and barks at every car that passes. I love it so much, especially when she barks during sleeping hours. Our home is on the roof of the house and has two small rooms and a small bathroom. We don’t have much space, but right now we don’t need much. Washing clothes is also quite the adventure. Our landlords do not want us to use very much water since they are paying the bill so we can’t use our laundry machine. Mario (the man) gave us the suggestion to wear our clothes in the shower like he does to wash them. Yeah that’s not going to happen. 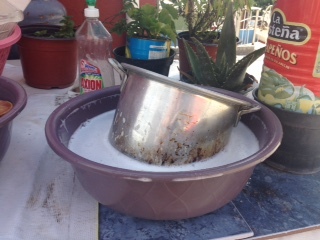 Today I washed a load by hand in a bucket with laundry soap, then set the soapy clothes aside and filled the bucket up again, but with rinse water. 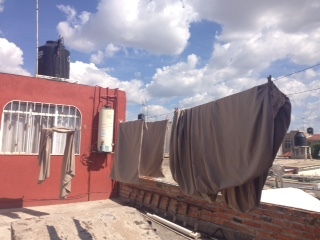 Afterwards I hung the clothes to dry in the sun. This last step I am used to, however, since no one here has a dryer. We all hang dry our clothes. Such a tiny load, but honestly, that’s all I want to try washing by hand. I am NOT a fan. So grateful for laundry machines. AND SO GRATEFUL FOR HERMANA MICHAUS. She has our laundry machine at her house so we can use it when needed. 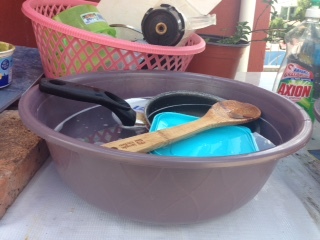 It is much easier to wash clothes at the neighbors than to wash dishes. All in all I really like our new home. I’m not sure how long we will last here, but it is so nice to be next to friends in a new city! Wow! I live in the Mexico City area, but I’ve been to Aguascalientes and it’s pretty nice over there. I know what you mean about the washer. I didn’t have one when I first got married and it was real hassle! 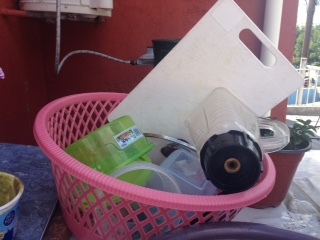 We also didn’t have a sink lol 🙂 We saved up some money and my husband hired a worker to install a “lavadero” that I used to wash dishes and laundry. Crazy! Now, we have a sink, a washer, and everything except a dryer. That just is too much of a luxury around here! Wow, Ash, you really are a pioneer! This is so adventurous, makes me feel pretty spoiled to have a kitchen sink and dishwasher. But also helps me see how much we really can do without and still be happy (maybe happier??) Keep the chin up. Can’t wait to see the latest recipe!